Just a few weeks after holding the first Model 3 delivery in Canada, Tesla is gearing up to begin mass shipments of the compact electric car to the country. 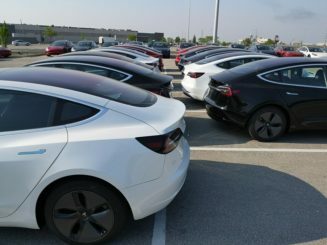 Just recently, photos and videos of a parking lot in Toronto filled with hundreds of Model 3 were shared online, suggesting that Tesla that is about to saturate the Canadian EV market with its most disruptive vehicle to date. 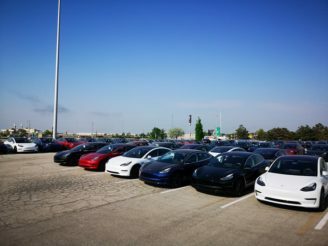 Jason Zhang, a member of the Tesla Owners Worldwide Facebook group, noted that when he took pictures of the vehicles, he counted roughly 300 of the mass-market electric car in the location. 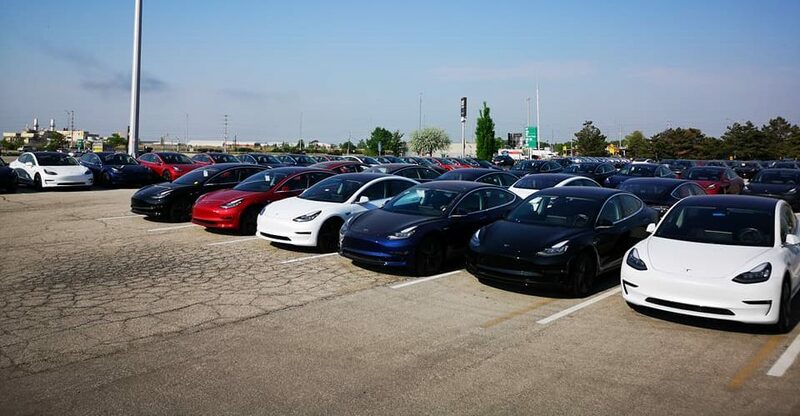 In a recent YouTube video, the Tesla Model 3 Owners Club stated that a nearby location separate from the parking lot was also filled with Model 3. Tesla started its Canadian push deliberately in late 2017. During November, a Model 3 with manufacturer plates was sighted making its way into Canada. On December, another Model 3 was spotted in Vancouver, British Columbia in the middle of winter. The electric car in the December sighting also had manufacturer plates, and considering the timing of its trip, speculations were high that Tesla was probably testing how the RWD electric car would fare on Canada’s snowy and icy roads. By late March, Tesla released the first configuration invites to Model 3 reservation holders in the country. The first delivery of the Model 3 to a customer from Canada happened in May. 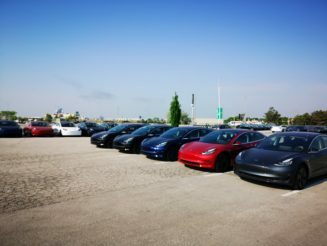 The event was documented and shared by the Model 3 Owners Club on their YouTube channel. The Tesla Model 3 is a particularly important electric vehicle among reservation holders residing in Canada. Earlier this year, the Ontario Ministry of Transportation published its updated list of electric vehicles that are eligible for incentives of up to $14,000 CAD. One of the qualifications of the incentive is that the car’s base price must not exceed $75,000 CAD. Among Tesla’s vehicles, only the Model 3 is considered eligible, as its base price is listed at $45,600 CAD. The incentive, however, could be changed or discontinued depending on the results of Ontario’s upcoming General Election on June 7, 2018. 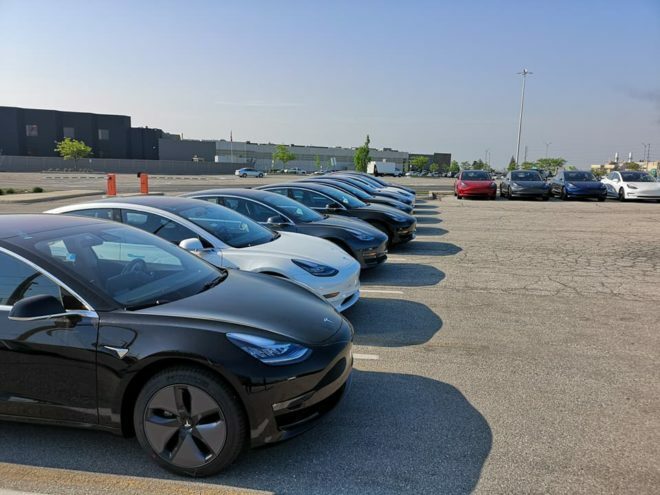 With this in mind, the hundreds of Model 3 ready for delivery that was recently spotted in the Toronto lot could be Tesla’s push to ensure that its first reservation holders in Canada could receive the full credit their cars are eligible for. While Tesla has struggled to meet its self-imposed goals for the production of the Model 3, recent signs from the company are very encouraging. Just recently, Tesla registered its largest batch of VINs to date. Elon Musk also announced the opening of orders for the vehicle’s next two variants — the AWD dual-motor and the Performance Model 3. Reports have also emerged that Tesla has flown in six airplanes’ worth of new equipment from Europe, which would be installed at Gigafactory 1 to further improve the production rate of the Model 3. 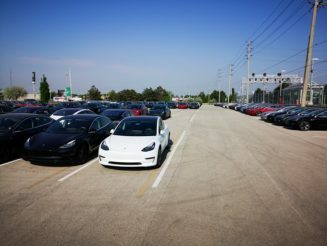 Check out Toronto’s Model 3-filled parking lots in the video below.